The owner of this remarkable reef aquarium resides in the Netherlands and is well known among many reef aquarists for his huge 20 foot long reef aquarium. Our client definitely wanted to cut his energy and maintenance cost that his previous metal halide system produced. He was previously using 6, 400 watt HQI, 14,000K lamps, 3, 1000 watt HQI, 14,000K, and 4, 140 watt actinic 03 fluorescent lamps. and at a later date switched to our Atlantiks because of their versatility and ability to program individual channels to suit his needs. Based on energy use in the US, the yearly savings in energy would amount to $2,250.00. He was not going to trust just any brand of LED lighting to provide thousands of dollars worth of corals their photosynthetic needs. 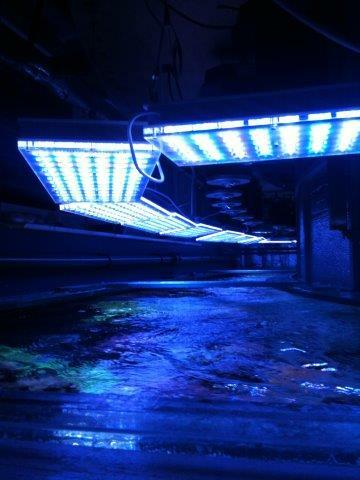 He wanted LED lighting that was going to be capable of providing the intensity, ability to penetrate deep tanks, and most importantly, the correct spectrum that is required for good coral growth. After much research and recommendation by Aquacompleet, He chose Orphek LED lighting for his gorgeous display. The owner’s massive aquarium is controlled by electronics in a separate relay cabinet which includes motor starters for the large water pumps, heaters, and other components and has circuit breaker protection for all components connected to it.